Use the links above to register online. OR, Click here to fill out a registration form to email/ mail/fax back to CANA Headquarters with your payment. In this increasingly competitive and litigious environment, possessing qualifications that set you apart from the rest of the industry is critical. The CANA Crematory Operations Certification Program™ (COCP™) is the mark of distinction. It ensures that you and your employees have the most current crematory operations training available in the industry and provides proof to the public of your commitment to safe cremation practices that demonstrate the utmost respect and caring for their loved ones. The content of this course is designed to increase your understanding of crematory operations and will provide you with a solid overview of best practices related to cremation. This training complements on-the-job training and machine-specific training you might receive. While this training will not guarantee you will get a job, it looks great on a resume. The Cremation Association of North America (CANA) was the first to offer Crematory Operator Certification more than 30 years ago and continues to be the market leader in cremation certification and training. Many states and provinces have now instituted training requirements for crematory operators and have selected CANA’s COCP as their official training program. You will gain extensive knowledge—technical, scientific, and legal—all of which is proactive prevention for future business problems. The class addresses major topic areas such as an overview of the cremation process, equipment and operations, the cremation process in detail, chain of custody, reducing legal risk, and environmental issues related to cremation. A detailed manual is also provided for use during class and serves as an important reference tool. Taught by industry experts, this program provides death care professionals of all backgrounds and levels of experience a thorough knowledge of the practices and procedures that will help reduce the risk of litigation. The course is offered as either an in-person course or as an online course. 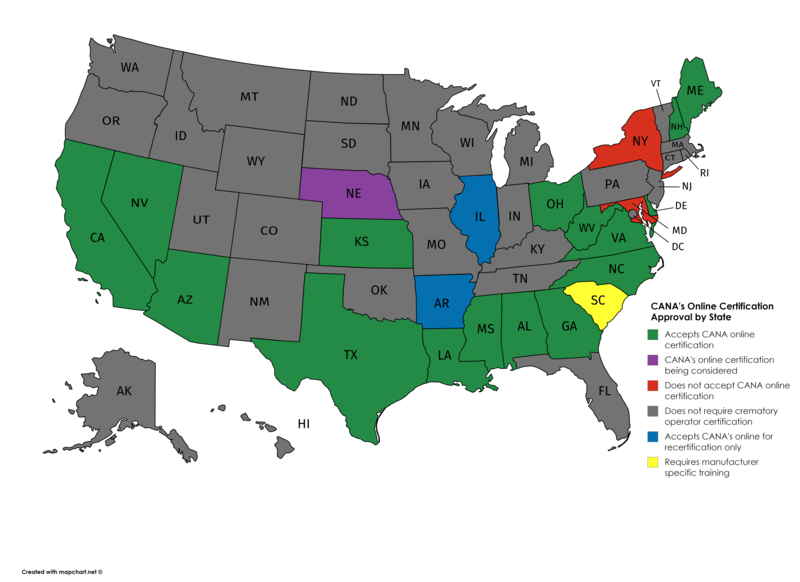 Click here to see which version your state will accept for certification and/or continuing education. The in-person course consists of 6 hours of classroom instruction delivered in one day (check the event calendar for upcoming courses), 2 hours of online instruction, and a final exam. The online module and the final exam are completed within two weeks of attending the in-person session. The online course consists of 8 hours of online instruction and a final exam. The course is self-paced; each time you log off, your last location will be bookmarked so you can resume where you left off the next time you log in. You have 90 days to complete the course once you begin. Demo the Online COCP! Try some exercises, get a feel for the format, and get a taste of the curriculum. Try a demo of our online learning curriculum to confirm your device meets the requirements and to see what the class is like! Students: $195 (must provide proof of enrollment in a funeral service or mortuary science program); register by submitting a completed registration form with proof of enrollment (any school documentation that includes student's name, program, school, and current term) and payment. Please email the forms to info@cremationassociation.org, and allow at least one (1) business day for processing. Call 312-245-1077 for assistance. 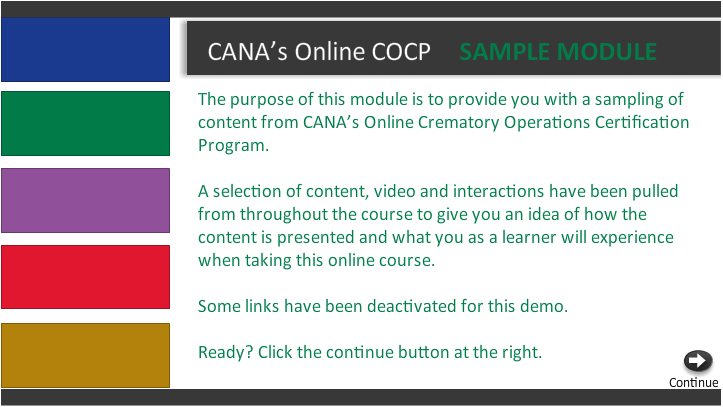 The complete CANA Crematory Operations Certification course. COCP Manual, provided at check-in for in-person participants or as a download for online participants. Crematory Operator Certificate, mailed after successful completion of all course requirements. Certificates are valid for five (5) years. To renew certification, you will need to take the course again. What do I have to do to become CANA certified? receive a score of 80% or better on the final examination. Whether you take the in-person course or the online version, the certification test will be completed through CANA Education Online. You will have three (3) attempts to receive a passing score. A print copy of the test is provided at the back of the manual for study purposes; however, the questions and choices are randomized when delivered online. A certificate of completion will be available for printing immediately upon passing the final examination (for purposes of validating continuing education hours). Crematory Operator Certificates are mailed at the end of the month in which you pass your examination. What are the pre-requisites for taking this class? There are no pre-requisite requirements for taking this class; anyone may register. If you have never worked in this industry before however, you may not be as successful. This class assumes a basic understanding of funeral service, especially cremation, and the content is taught as if all attendees are already working in the industry or have jobs in a crematory. How long is the crematory operator certificate valid? Certificates are valid for five (5) years from the date of the course. To renew a certificate, you will need to attend the course again. I lost my certificate/my name changed/my employer changed. Can I get a new certificate? During the five year validity of a certificate, a replacement copy can be requested due to loss or change in information. Certificates can only be mailed, not emailed. Expired certificates will not be reissued. Will I be able to operate a cremator after taking this class? We do not teach how to physically operate a cremator in this class. This training complements on-the-job training and machine-specific training you might receive. Each piece of equipment is different, and your employer and/or manufacturer will provide training on specific equipment. Will I be able to get a job as a crematory operator/technician after taking this class? There are many factors that contribute to your success in attaining a crematory operator job. It is routine for employers to conduct background checks, talk to references, and interview you. In addition, you will need to contact the regulatory board in your state to determine what their requirements are for crematory operators. Each state has their own regulations and requirements. Some states require Operator Certification such as this class, and some do not. Some require only that certification is taken once, while others require that it be renewed every five years. Employers have their own requirements and expectations as well and these vary widely based on business practices. It is your responsibility to talk to prospective or current employers, as well as regulators, to determine if you should take this course. I want to open my own crematory. Should I take this class? Do you have land or a building? Is it zoned for your business? Will your community welcome you with open arms? Have you talked to equipment manufacturers to understand the total up-front and annual costs involved? Do you have relationships within the community and an established network of potential customers? While the content of this course is designed to increase your understanding of crematory operations and will provide you with a solid overview of best practices related to cremation, you should consider answering some of the above questions before you invest in this course. The classroom training will start with an overview of the cremation process by introducing basic terminology and process flow. Distinguish between commonly used terms. Summarize the overall process of cremation from the time a dead body is received until cremated remains are returned to the family. The equipment and operations module will cover the science and control of combustion, common components and features, safety and PPE, and maintenance. Describe the process of combustion, including the inputs and outputs, and how to control the rate. Name the common components of a cremator, and briefly explain their purpose. Describe the importance of temperature control. Identify the cremator components that require regular maintenance. List the Personal Protective Equipment (PPE) that should be worn when operating a cremator. A detailed discussion of the cremation process will address receiving remains, preparation for cremation, handling special cases, and the steps of the process itself. Explain the key processes and steps in the receiving, preparing, recovering and processing of remains. Documentation is key and this module will cover different types of forms and documents used, address the risk of liability and common errors, and then cover the documentation related to the receiving, tracking and return of remains. Identify and use the proper forms for documenting chain of custody. Aside from chain of custody, there are other important areas to focus on to reduce legal risk. This section addresses operations, staff training, compliance, handling regulatory investigations, and third party crematory considerations. Describe additional ways that a business can minimize legal risk. To wrap up the day, attendees will work in small groups to analyze several “what would you do?” scenarios, to identify the correct and incorrect actions, all based on the discussions of the day. Familiarize yourself with the fact and fiction of cremation’s effect on the environment. Explain the suggested guidelines for recycling, including compliance, disclosure, procedure, procedure and compensation. Describe your options in the recycling marketplace. Determine whether or not your business should recycle metals from cremated remains. Describe the legal aspects regarding recycling. Describe the key findings of the 1999 US EPA Emission Study. Explain how mercury emissions from cremation impact the environment. The final exam will consist of 50 questions covering all 7 modules. The test will be taken after completing Module 7, allows 3 attempts for a passing score, and is open book. Bob is a second-generation funeral director. With over 20 years of experience, Bob is a funeral, cemetery, and cremation expert who is dedicated to improving the funeral profession. 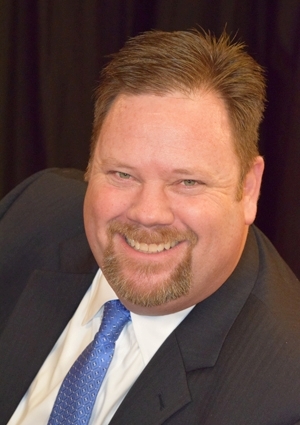 David M. Daniels is the managing partner of Gilbert, Kelly, Crowley & Jennett's Sacramento Office. Mr. Daniels has over 20 years of trial and transactional experience in cases involving: professional and medical malpractice, complex insurance coverage, class action litigation, labor and employment law, catastrophic injuries, commercial litigation, and hospitality law. He has successfully litigated numerous cases in California's state and federal courts, in addition to handling a multitude of arbitrations and mediations. 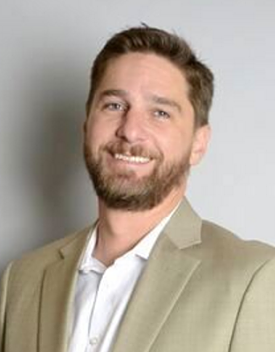 Chris is a graduate of the University of Houston Law Center (J.D., 2001) and Purdue University (B.A., 1998). He was a member of Sheehy, Ware & Pappas, P.C., dealing with death care law, labor and employment law, and commercial and general litigation and previously served as General Counsel to the Cremation Association of North America and was on its Board of Directors. He has considerable experience handling trial and arbitration matters, and has presented briefings before several Texas Courts of Appeals and to the Texas Supreme Court. Mr. Farmer has managed EEOC, OSHA and State Regulatory EEO investigations for employers throughout the United States. Tom has a B.S. degree in Construction Engineering from Syracuse University and the State University of New York. 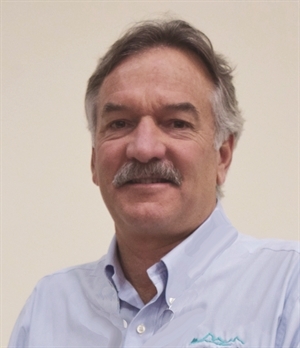 He has spent 38 years working in the Building Materials, Fire Testing, and High Temperature Insulating Materials Industries. The past 10 years have been focused on new cremation equipment technology and installation techniques. His depth of knowledge of construction, environmental impact, and zoning regulations benefit crematory operators at every level. Bill is a Licensed Funeral Director/Embalmer, CPA and attorney-at-law who focuses his practice in Individual & Family Estate Planning, Business Succession Planning and Wealth & Legacy Protection. He serves as a trusted advisor and experienced problem solver to many family-owned business owners including a number of funeral homes, crematories and funeral acquisition companies located throughout the United States. Bill obtained his Business & Accounting degrees from University of North Carolina-Chapel, his Juris Doctor degree with highest honors from University of Florida College of Law, and his Masters of Law degree in Estate Planning from University of Miami School of Law. John joined IR Environmental in 2018 and has years of experience in the rebuild and repair of all types of cremators. 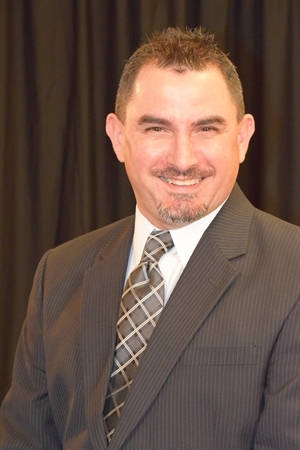 He has over twelve years of experience in the cremation industry that includes crematory operator training. George Prather is a former licensed funeral director, embalmer, and crematory manager with fifty years of experience in the death care industry. He is the former owner of Lombard & Co., Funeral Directors and the Sacramento County Crematory in Sacramento. George is a past president of the California Funeral Directors Association and was Director of Compliance and Safety for Stewart Enterprises’ Western Division for fifteen years. Michael has been a funeral director for over 20 years and is Past President of the Cremation Association of North America (CANA) and is a member of the Ottawa District Funeral Association. In his tenure with Pinecrest Remembrance Services, he has been part of the creation of Ontario’s first full service facility with onsite visitation and receptions. Larry is a graduate of Kent State University and is a past member of the Board of Directors of the Cremation Association of North America (CANA) as Supplier Liaison. Through his experience Larry has seen first-hand the negative impact that poor crematory maintenance and improper operating procedures can bring about. Larry has spoken at numerous industry events and has conducted crematory operator training classes across North America with a mission to advance the safety of cremation facilities and their employees and to more positively impact our community and our environment. Barbara has over 15 years of experience developing and marketing member benefits, providing leadership in professional associations, fundraising and creating professional development opportunities. 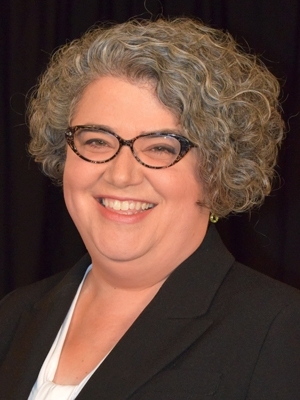 Most recently the Directors of Member Services at the American Theological Library Association, Chicago, Illinois, she previously served as Vice President of Library and Nonprofit Services at the Donors Forum, Chicago, Illinois. Barbara has a Master’s degree in Library Science from Dominican University, a graduate certificate in nonprofit management from North Park University and a B.A. from Earlham College. A former high school science teacher, Jennifer has 16 years of experience in education. She holds a Bachelor’s degree in Science Teaching from Clemson University, a Master’s Degree in Curriculum, Instruction and Assessment from Walden University, and is a Certified Professional in Learning and Performance (CPLP). 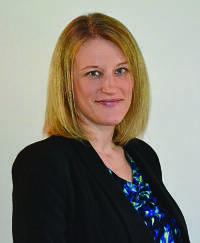 Jennifer began working for the American Foundry Society in 2005 and served as the Director of Education from 2010-2015, where she was responsible for the administration and operations of the AFS Institute’s programs and facilities, and initiated a complete redesign of Institute programming, including both classroom and online courses. Jennifer joined CANA in 2015, and brings a wealth of experience in best practices for workplace learning. The COCP is offered several times throughout the year, with new offerings added to the website 2-3 months before they are to be held. Increase your level of professional services and marketability with the CANA crematory operators certification program. Please check our calendar of events frequently to see where the next offerings are to be held. CANA is grateful to Implant Recycling for their generous support of the COCP programs.